It's that time of year again. The last week in May and the first week of June. It's the annual lads trip up to the Scottish Highlands. This time there's a full week of A road blasting with tea and cakes in between. That's 7 nights in the BnB, sharing a room with some other bloke who's probably going to snore. 8 Days of riding, although 2 of those days will be the journey there and back. It's a holiday, although experience tells me that it may be a lot of fun but there won't be much relaxing or chilling out. For the past couple of weeks I've been getting ready. 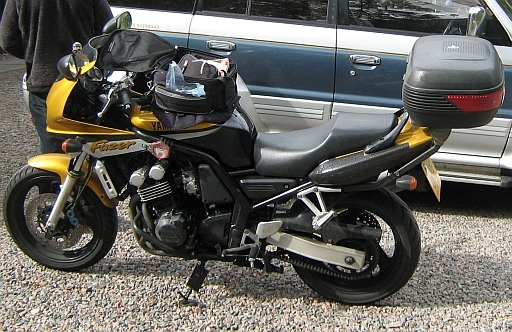 The bike's now wearing 2 shiny new Avon Storm 2's, has fresh oil and filter, been checked over like a worried mother checks on her baby every 5 minutes even when she knows it's fine, and every moving part has been stressed over. The list of things to take has grown and grown, been revised and updated and then packed and re-packed. Don't get me wrong, I'm not paranoid...just...well...you know...I like to be sure. I think I'm ready...but only think. The weatherman says the weather's going to be wet wet wet! Great. Just what you need when there's over 300 miles to be covered. Oddly enough I expect to be up at the crack of dawn as my brain whirls with worries about what I've forgotten and that final, final check on the bike. Yet I awake to the alarm! I think the presence of my Girlfriend has calmed me, that and the fear of disturbing her precious sleep. I get up to a damp morning, not wet but damp. After dressing, eating and feeding the Girlfriend I prepare to leave. I feel strangely calm. I'm still making sure I'm prepared and ready, that all is packed and all is well with the bike, but in a calm and natural manner. Most unusual, I must be getting used to this travel thing...it's only taken me 20 years. There are 8 lads travelling up today. 4 of them are in 2 vans with the bikes in the back, softies. I've no idea how or when the other riders are riding up, I'll be riding alone today. Sometimes it's nice to share a ride...but sometimes I like a slow motorway pace which can frustrate the hell out of anyone daft enough to ride with me. So it is I hit the M61 at 10am. The rain is light but steady, not enough to get me really wet but enough to require waterproof protection. There's nothing to report. The traffic's average, the temperature is fine, the rain is light and the motorway just rolls past at a steady 65mph. OK, ok I know, I'm on a Fazer 600, capable of 140mph but I'm just in the laid back state of mind and happy to watch the cars flash past me while I gently pass the lorries. The bike feels nice. Smooooooooth. No chain rattle, no vibes, no wobbles and the standard exhaust is quiet at this pace. Happiness. My mind wanders through to the forthcoming week. What will the weather be like, will the lads behave themselves, will the snoring keep me awake, will I ride too fast and will the bike be OK. I'd love to be able to turn these thoughts off and just enjoy myself, but all I can do is take comfort in the knowledge that worrying must be a curse of intelligence. Or is that the curse of vanity? I stop at Tebay services. It's a favorite of mine as it has a character of its own...as much as a service station can have a character anyhow. I give a little cheer as I cross the border into Scotland then my heart sinks as a matrix sign warns of the M74 being closed from junction 6. I stop at Annandale Water services to check my maps and realize this will stop me getting onto the M8 towards the Erskine Bridge. Stuff it, I'll carry on in the hope it will have cleared when I get there. Nope. 15 miles of queuing cars and lorries means I'm down to filtering at 10mph. I am so very thankful I'm on the bike, but it's slow, stressful and tiring to work through the queue. It still takes the best part of an hour until I hit the diversion. I'm worn out from the filtering and concentration is hard in the strange town of Hamilton that is being hit with thousands of diverted vehicles passing through its ill-prepared streets. The diversion is badly signposted but somehow I eventually find myself back on the M8 and heading west, which is correct. The Real Food Cafe, Tyndrum. It's not cheap any more, but when you're tired and hungry it's worthwhile. I stop for fuel and a smoke at Dunbarton just after the Erskine Bridge then plod slowly alongside Loch Lomond for what now feels like an eternity. Loch Lomond is beautiful, but the road is slow due to the caravans and campervans that are barely able to negotiate its winding road. 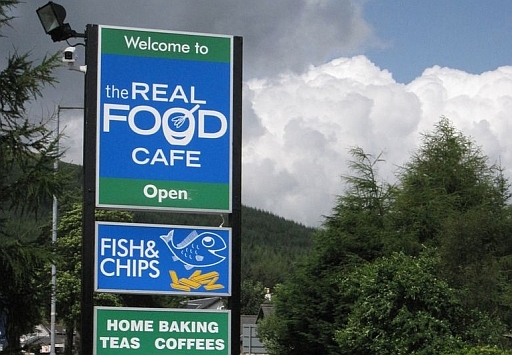 It's only determination and hunger that drives me on to reach the comfort and warmth of the Real Food Cafe at Tyndrum. Oh sweet chips and burger, come ease my aching body and grumbling bowels. It costs over 7 pounds for my burger and chips with a brew, but it's worth it. It does not take long at all for me to feel much revived and ready for the final stretch to Fort William, my home for the next 7 nights. As I travel along Rannoch Moor, I notice a change. I'm doing 70 and so is the rest of the traffic. No more crawling here, it's head down and SHOOT! I pass a car on the approach to a bend and hook it down a couple of gears and the exhaust howls in response. I spot the exit to the bend and crack open the throttle, then laugh madly as the power chimes in and I swoop out and away. Now I remember why I travel all this way.